This week, I found myself at Portland’s Doug Fir Lounge three days in a near row. While it is perhaps my second must frequented venue after Holocene, rarely do I have the chance to go so many times in one week, and to observe such varying acts. Hence, in celebration of today’s full moon in Gemini — just like our Intuitive Navigation event tomorrow eve at Holocene — I shall endeavor a twin review of two notable female acts: Bay Area R&B singer Goapele and indie rock veteran My Brightest Diamond, both of whom put on great shows, but in vastly different ways and to vastly differing crowds. 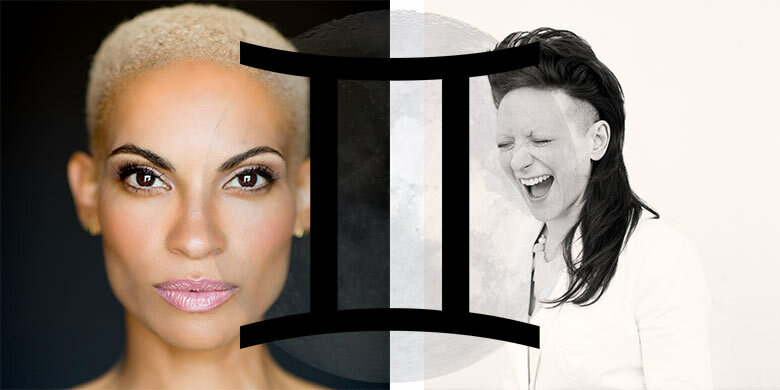 The full moon represents the femininity and intuition, and today’s Full Moon in Gemini (during a Sagittarius month) looks to the twin sign for an outwards celebration of life. On Thursday night, Goapele Mohlabane took the stage a dizzying one-and-a-half hour late, for apparently no reason at all. When she emerged, all smiles and wearing a bright royal blue and red floral kimono, it seemed such an infraction was likely on purpose. After all, she was the only act billed on a show titled an “Intimate Evening With Goapele”, so why not stall a little bit? Luckily for Goapele, it seemed that the diverse audience’s bitching and moaning faded away at once, and their gripes turned into vocal choruses of appreciation. Included in that appreciation was the oft-repeated but simple excitement that, lo and behold, Goapele had actually decided to perform in Portland instead of skipping it to play in Seattle! Mohlabane began with a number of songs from 2011’s Break of Dawn record, and it took me half a song and plenty of noodling from her three-piece backing band for me to realize that I knew it. In a live setting, Goapele’s arrangements and instrumentation are quite different from her more muted studio recordings; it seemed that the filler music of mellow jazz that played just before her set were indeed an appropriate choice for what would follow. But I digress, and that is certainly not a criticism — merely an observation. Goapele certainly dazzled the crowd with her sparkling eyes, magnetic voice, and ability to say concisely profound things against constant shouts at her to “get it gurl” or “go go go”, even during ballads. Notable statements were a one-liner about the shifting complex nature of romantic relationships and how they relate to each and every one of her songs, as well as a shout-out during “Strong As Glass”, which celebrated mothers, teachers, students, activists, and anyone who works hard, feeling solid one moment and fragile the next. The lady has got soul and exudes a magnetic kindness, and if her newest single with Snoop Dogg and her upcoming material are indicators, bigger things may likely be headed her way soon. That evening, she performed “Powerful” off her latest record, and it was my favorite of the night by far. It is difficult to tell exactly what the final product will sound like, but stuttering club rhythms and vocal stylings reminiscent of Beyonce combine with Mariah Carey-esque wails and what I would say is some of her most challenging material in terms of songwriting and dynamism. But even more important was the look in Goapele’s eye — of someone eager to showcase a new track with passion; of someone capable of moving to the next level by fully embodying the song’s title. Continuing the feminine spell the next night was My Brightest Diamond — not to be confused with My Morning Jacket, if you knew what was good for you. More than ten years ago, I saw Shara Worden open for The Decemberists at Seattle’s massive Paramount Theatre, during the height of the world’s love for literary pirate songs. She did not make an impact on me at the time, save for the memory that she had a great voice. Fast-forward a decade, where I find myself at Doug Fir, surrounded my people ranged from my age-ish to a good twenty years older, all largely Caucasian. Worden’s performance now comes on the heels of This Is My Hand, which is shockingly one of my favorite albums of the year. Dare I say it is even better In person…? Control can be found in every timbre of Worden’s voice, which can throttle up to operatic highs and settle down into rich lows — or showcase a naked restraint as it slowly diminish into the night. Dynamism shows through a meticulous attention to detail; styles alternate between ballads, dance jams, and rock out numbers with equal conviction, all left with plenty of flexibility, to oscillate between tight and loose moments. And finally, the strangeness, purely adorable and showcased by atypical songwriting and lyricism, as well as Worden’s stage gestures, which are crammed full of time-synced theatrical hand movements and innovative ways to engage and speak directly to the crowd. Among my favorite of these was when a fan complimented her and she bowed in appreciation, in repeatedly smaller and smaller movements, in probably a good minute of silent transition to the next track. Witnessing My Brightest Diamond’s output this year, I had felt implicitly that she would be a fan of dance, and tonight, watching her work, I sensed an conscientiousness and awareness about her person. Throughout the night, a small group of white leotard-wearing gals — and one guy — boogied in the crowd and, during “Lover/Killer”, handed out a hundred paper hearts on sticks. As they were Portlanders, I wondered aloud if they were crowdsourced hypepersons, and soon, an onstage dance performance to “This Is My Hand” raised even more questions. How did they learn the choreography so fast?! Did Worden hire different dancers every city?! Wouldn’t buying new leotards each night be prohibitively expensive?! Fan or not, it is hard not to acknowledge that Worden is a damn good showwoman; her multi-instrumentalist chops are excellent, down to every resonantly satisfying choice of key and guitar tone. And oh yeah, she closed out her encore with the chaotic “Freak Out”, which one showgoer said reminded her of “going to church” — if her church were drum n’ bass church, I suppose — as well as probably one of the best covers of Ella Fitzgerald’s “Fever” I have ever heard. I might even call it perfect. One of the best shows of 2014.